BalleBaazi App Refer & Earn:- BalleBaazi is a new fantasy site and if you use BalleBaazi Referral code in registration process then you will get Rs 50 SignUp bonus. A very large excitement of our Indian people is present towards Cricket and this crowd of cricket lovers brings an invitation for the companies to create Fantasy Games. If you haven't understood then we are going to tell you that there are many companies like Dream11, Halaplay, Playerzpot, Fantain and much more are providing real money directly to your Bank Account. 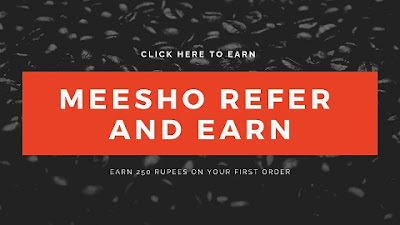 Meesho Refer Earn - Get 250 Rs Bank Cash. Our mean to say that if you have a great knowledge of Cricket then you can earn easily and a huge amount to your Account. These are the online platforms where you have to play the game using referral code or we can say that you are the selector of your own team. Different Websites have different rule and regulations. So, keep rules in mind and convert your knowledge into your earning. Many questions come to your mind that Is these games are legal or not. Before registering on any website or app you should have to read their agreements that they are following our Indian Law or not. So, Here we are going to tell you a website named "BalleBaazi.com".Let's read more about this site. BalleBaazi App:- BalleBaazi.com or BalleBaazi App is a Fantasy sport like Dream11, Halaplay. This website was launched in 2017. Only the age of above 18 years can play here. BalleBaazi offers you to create 11 members team from both opponents and then select your Captain and Vice-Captain. Caption scores 2x point and Vice-Captain scores 1.5x points. If you are not comfortable with 11 members team, you can play different formats like you can choose your 5 best batsmen team and you can include your 5 best bowlers to create your team. According to your various teams, there are plenty of paid leagues which you can join with your suits your wallet balance. BalleBaazi App Fantasy Formats: Most of the Fantasy player create their team in which either Batsmen performs very well or sometime Bowlers performs well but for winning your leagues, you should require a balance 11 player teams. But we inform you that BalleBaazi App provides you 3 different Fantasy formats to play Cricket in a different way. If your Batsmen play well, can play Batting Fantasy or If you are a creator of best Bowling team, can play Bowling Fantasy. So, Let's come and see it. BalleBaazi provides you a total 100 credits in Classic Fantasy. You have to make your a total of 11 players virtual team from both sides. You can select min. 4 and max. 7 players from each side. In Classic fantasy, You have to select 3-5 Batmen, 1-3 Allrounders, 3-5 Bowler, and 1 Wicket-Keeper. After selecting a total of 11 players, you have to choose 1 player as Captain and 1 as Vice-Captain. Select your precious player as Captain because of the Captain gives you 2X points and Vice-Captain gives you 1.5X points. Successfully, your team is created, now you can join any free or paid leagues. BalleBaazi provides you a total 45 credits in Batting fantasy. Here, you have to create your team with a total of 5 Batsmen. You can select a maximum of 3 Batsmen from each team. After selecting a total of 5 Batsmen from both sides, Select your Best Batsmen as Captain and Vice-Captain. Captain gives you 2X points and Vice-Captain gives you 1.5 points. Successfully, you have created your Batting team. 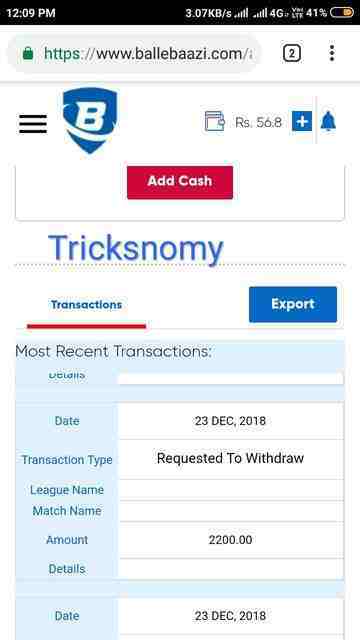 Now you can join any free or paid leagues. BalleBaazi provides you a total of 45 Credits in Bowling Fantasy. You have to create a team with a total of 5 Bowlers. You can select 3 bowlers from a team. Just selecting all 5 bowlers, Select Best bowler as your Captain and Vice-Captain. Here, Also Captain gives you 2X points and Vice-Captain gives you 1.5 points. Now, Your team is created and you can join any free and paid leagues. There are various play fantasy cricket games where you can win Real Cash that'd be bank transferrable too. We are providing some best fantasy cricket win cash games. By playing these fantasy cricket you can make sound money using your cricket-knowledge skill. Fantain Fantasy Cricket App - Get 60 Rs. Sign Up + Refer Earn. Playerzpot Fantasy Cricket App - Get Sign Up Bonus + Refer Earn. Fabulous11 Fantasy Cricket App - Get Sign Up Bonus + Refer Earn. League Fantasy Cricket App - Get Sign Up Bonus + Refer Earn. Zingura Play Predict & Win Real Cash. This is a new Fantasy site so that your chances of winnings are more. It's a genuine website and now BalleBaazi app is available at this time for all, very few are familiar with this website. So don't be late and starts playing and earn more. As there is mention refer and earn program and you will get a signup bonus of Rs 50 just by entering BalleBaazi Referral code "SHYA0Z1" in the registration process. 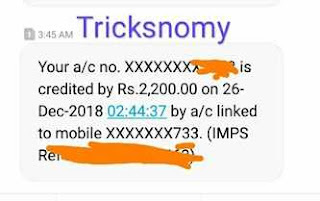 After successfully verify of Mobile number, you will get Rs 50 bonus. First of all, you have to go on BalleBaazi. Here you can see two option, First for Login and other for Register. if you are an existing user, can log in or if you haven't registered here can be registered via Facebook or Google. The most important option is the BalleBaazi Referral code, which is "SHYA0Z1".Enter this Code in your Referral code checkbox. BalleBaazi Referral code is necessary to get Rs 50 bonus. Mark tick to the box which is for "Terms & Privacy". Filling all things and last click on "Register" button. Verify your mobile number to get Rs 50 Sign up bonus. After verifying the Mobile number, check your wallet balance shows Rs 50. Finally, you have created your account on BalleBaazi. First of all Login your account. Select any Series and Click your suitable match Click on "Create Team." BalleBaazi site provides 100 points to you for creating your team. You have to select 1 Wicket Keeper,3-5 Batsmen, 3-5 Bowlers, and maximum 3 all-rounders in your team. Keep ensuring that you have a total of only 11 players only. After creating your team Select one player as Captain and another one as Vice-Captain. Join any league that suits your balance. The step refers to and earn is very important for everyone. On the BalleBaazi website, there is no any refer and earn scheme. but on BalleBaazi app, you can earn cash bonus by just inviting your friends. So, just follow some instructions and Earn cash bonus. First of all, open BalleBaazi app on your mobile. Click on "More" right lower side. You can see "Refer & Earn" option, Click on it. Here you can see your invite code or you can say your "BalleBaazi referral code" like that "SHYA0Z1", which you have to share during the invitation. Just see a blue color button "Share", Click on it or share it through various social media apps. Or Copy your Referral Code and send it to your friends. One thing you have to keep in mind that you can change your Name, D.O.B, and your Phone Number until your account got fully verified. Update:- Good News for the all the users that BalleBaazi team have increased Referral bonus from Rs 50 to Rs 100. You will get this increased bonus when your referral user adds Rs30 to their wallet. Adding or Withdrawal of money is also the main thing in any Fantasy sites and apps. Adding Money-Go to "My Account" and Click on Add. BalleBaazi provides 3 Adding money methods. Cards-You can Enter your Credit/Debit Card Number, CVV, Expiry, and Name on the card through this you can add money instantly. Wallets- BalleBaazi also offers many Digital Wallet for adding money to your Account. These wallets are Oxygen Wallet, Freecharge wallet, Payzapp wallet, Airtel Wallet and Pay cash wallet. 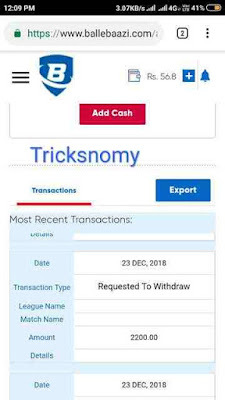 (Proof)Withdrawal:- Once you earned Rs 200 by playing, then you would be eligible to transfer your earning to your Bank Account. You can redeem From 200-2,00,000 Rs. But before Withdrawal, you have to verify your "BalleBaazi" Account. BalleBazzi App Deposit Code: BalleBaazi App provides an Extra bonus to their users while adding money. 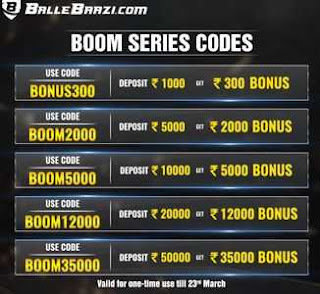 Whenever any user adds money for playing upcoming match into their BalleBaazi App wallet, then you have to give some deposits codes which you can apply and get an additional cash bonus. Let's come and check various Deposit codes. DEBUT100: You will get 100% Extra Cash Bonus when you add money of Rs 100 and you should apply the Deposit code "DEBUT100". Update: As we updated that BalleBaazi is going to launch their Application for iPhone users. So, The wait is over and BalleBaazi App is now available for both Android and iPhone users. Now, users can easily download BalleBaazi apk and can enjoy a lot of fun. Launching date of BalleBaazi app was not confirmed but from 18th of September BalleBaazi App was ready for the Android users and from 18th November, BalleBaazi app is available for Ios users, we can easily download, play and earn more cash. Actually, this app was in beta phase and available for some users, but now, this app is officially launched for all the users, so download BalleBaazi app and play. Nowadays. Women Big Bash League T20 is going on, so to earn more play BalleBaazi app. This Game is Valid for the age of above 18 years. You can play this game with a single account only. Before Withdrawal, you have to upload your Documents correctly. It takes some time for verification. You get your money within 5 working days. So this was the post about the BalleBaazi App Refer & Earn. Where you can play a fantasy game such as cricket, football etc and can win real money cash. However, you can get Sign Up 50 Rs Bonus while registering on BalleBaazi App by entering our BalleBaazi Referral Code- SHYA0Z1. So start referring BalleBaazi app to your friends and earn real money playing games. Rauti Ji, First of all i cleared you that BalleBaazi app is not fake app. Secondly its a new fantasy sports app that why they have their own Terms & Conditions, And if you think that they asked you to add money don't be serious because you have to be asked to add Rs 30 to your Ballebaazi wallet for just one time. Its their Terms & condition also. So, just follow their rules and enjoy Ballebaazi app.